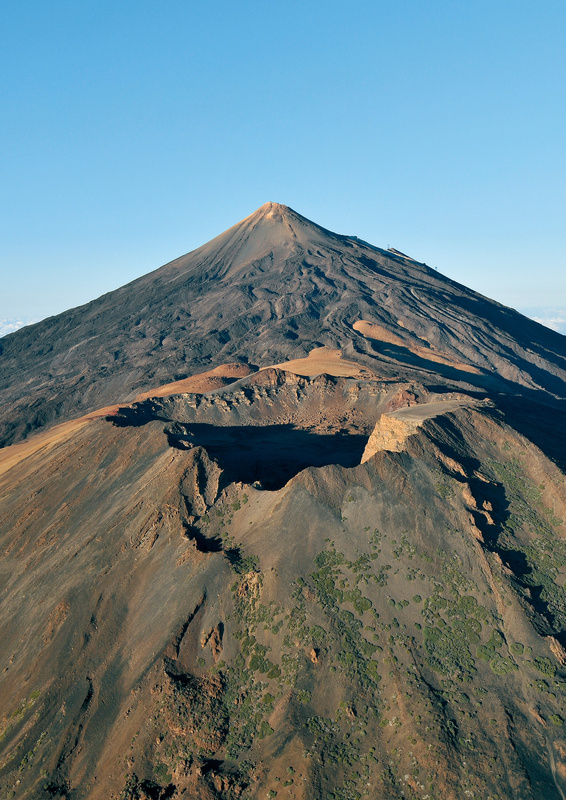 Obtaining the permit issued by the direction of the Teide National Park can be a challenge. Not because it is technically difficult but because the requests are many and the availability, limited: 200 permits a day, no more. We’ve explained this in detail in our post on how to get a Teide permit, but in this piece we’re focusing on solutions:: Is it possible to climb Teide without a permit? What should we do if there’s no way we can get a permit? What alternatives are there for climbing Teide without a permit when you haven’t applied in time to get the free permit that allows you to climb to the summit? Read on carefully, as there are various options open to you and our mission here is to make sure that once you’ve finished this post you’ll have made a decision. An important note: Climbing Teide without a permit up to the very summit is not possible unless you spend the night at the Altavista Refuge. Therefore, the options that we present here are alternative activities which you can do if, for any reason, you don’t manage to get the permit to go up Mount Teide neither on your own, nor with our hiking activities—an option which we talk about here. Trail No. 10 from Telesforo Bravo to the summit of the Teide, accessible only with a permit or by spending the night at the refuge. Trail No. 11 to the La Fortaleza viewpoint, with views over the northern side of Tenerife. Trail No. 12 to the Pico Viejo viewpoint, with views to the southern slopes of the island. Trail No. 7 from Montaña Blanca to La Rambleta, which leads to the Altavista Refuge. Out of all of the options for reaching Teide’s summit without a permit, this is the one we recommend most. 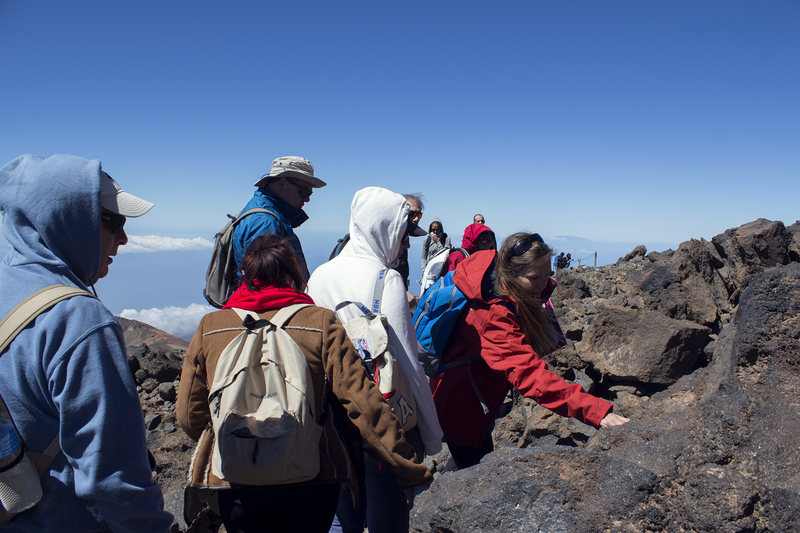 The Pico Viejo Teide trail starts at La Rambleta and ends at a lookout point with views over the crater of the Pico Viejo volcano. This is a 751 m trail of medium difficulty that will take you about 30 minutes to walk with an altitude change of 55 m.
The attraction of this trail isn’t just the viewpoint at the end, but the walk itself, as you’ll enjoy some of Spain’s most beautiful views the whole way along. When you start the Pico Viejo trail you’ll be looking towards the Cañadas Caldera, which today marks the boundary of the Teide National Park. As you walk you’ll start to see debris with a yellow tinge to it, a result of the sublimation of the gasses expelled from the bowels of the still active volcano, as the vents that you’ll pass by show. 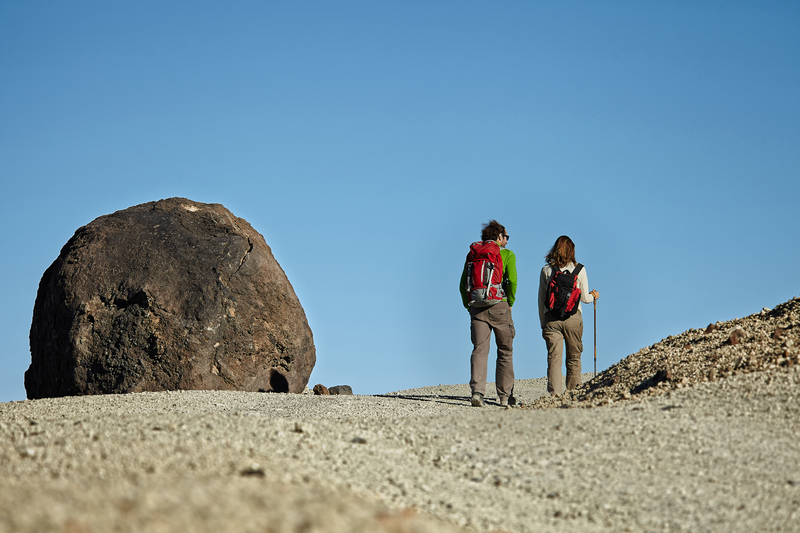 This walk is made magical by the views of other spectacular formations like the famous Corbata del Teide and the Roques de García. You can do this on your own, but it’s not a patch on doing it in the company of one of our guides. Our official National Park guides are qualified to pass on anecdotes and explain the history of the volcano, as well as every detail of its flora and fauna—they are professionals who will make sure you don’t leave without knowing all there is to know about everything you come across. Anyway, where were we? As we were saying, after walking over tongues of lava along a trail that’s impressive from both a scenic and a volcanological point of view, we’ll reach the viewpoint from which you’ll see the crater of the Pico Viejo volcano. To say it’s unique would be an understatement. Its 800 m diameter and symphony of colours will leave you speechless. You can ask your guide to explain this to you in more detail, but here’s something to whet your appetite. The immense crater has erupted various substances through different escape routes during its life. 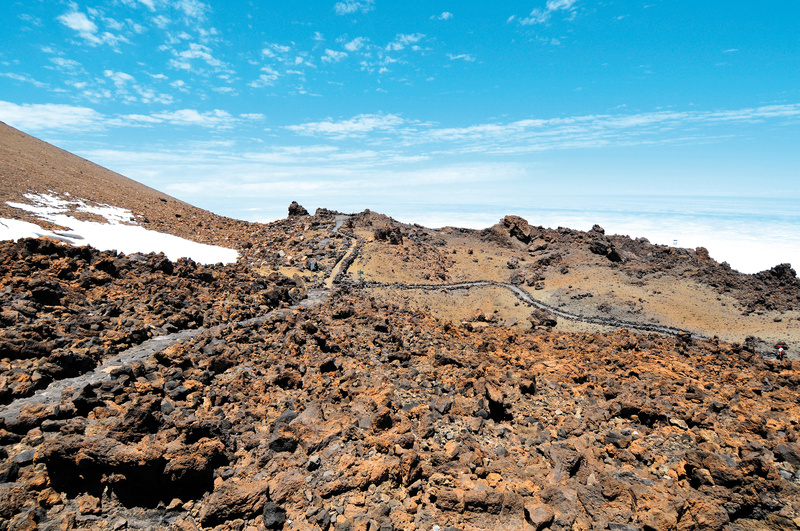 The combinations of these substances has resulted in what today is the incredible mantle of the Pico Viejo’s crater, which offers some of the most spectacular views of the Teide. Looking beyond that, weather permitting, the scene is perfected by the chain of volcanos in the background, the Teno massif and the islands of La Gomera, El Hierro and La Palma. That’s not something you see every day. You’ll head back along the same trail, and at the end, you’ll have to head back down to the cable car’s base station. The guided tour lasts 90 minutes, whereas if you do the walk on your own you can’t spend more than an hour up at the upper station and on the trail. 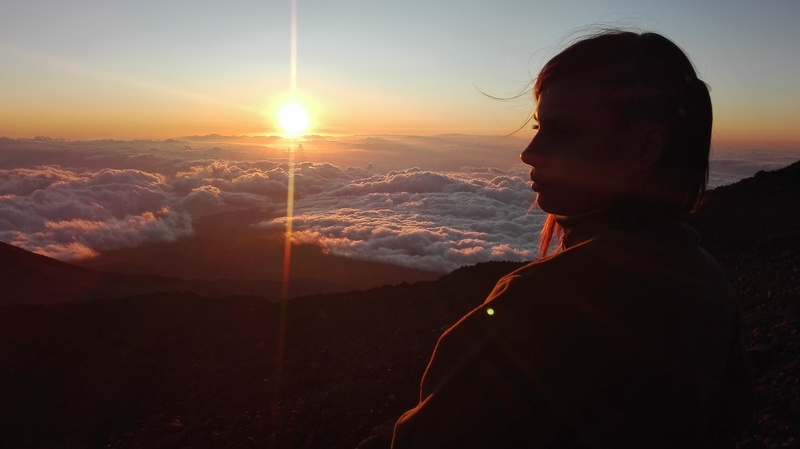 Picture everything we’ve told you about the Pico Viejo trail and now, add in the soft glow of the sunset in the background, views to Gran Canaria and the shadow of the Teide, the largest shadow thrown over the ocean in the whole world. A pretty good way to climb the Teide without a permit, right? A fantastic one, we reckon. You’ll fall in love with the riot of colours that will unfurl before your very eyes. If you’re a fan of sunsets, you can’t miss this one from the Pico Viejo viewpoint. The only thing that’s different about this activity is the time it takes place, which will depend on the time that the sun sets and will change depending on the time of year. NOTE about the guided tour to the Pico Viejo viewpoint with cable car included: If the Teide is closed due to the weather or the cable car can’t be used for technical reasons, you can choose between changing the date of the activity, doing a different route + changing the date of the cable car ticket, or doing a different route and requesting your money back. There will of course be no charge for this. You can make these changes and more with just a few clicks on the Manage your booking page. This is another good option if you want to climb Teide without a permit. This trail also begins at La Rambleta, and it will take you 25 minutes to walk 585 metres, with an altitude change of 21 metres. The whole trail runs along lava channels. It’s very uneven, and when you penetrate the heart of the malpaís landscape you’ll experience first-hand the chaos that forged the cracks in the superficial crust of old lava flows. 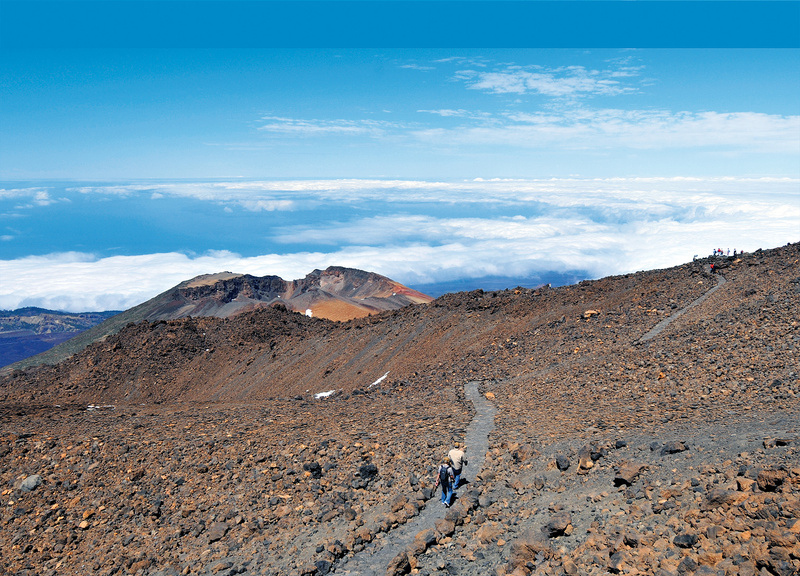 It’s a fascinating route that will also take you past vents and surprising volcanic formations. It ends at the viewpoint located above La Fortaleza, a large formation set apart from the caldera wall. They start at the Rambleta, so you have to reach the upper cable car station. The guided tour along the Pico Viejo trail includes the ascent by cable car, so the meeting point is the base station, but you can only do the La Fortaleza viewpoint trail on your own: you’ll need to buy your cable car tickets here. If you go on your own you can go up whenever you want, bearing in mind that the cable car operates between 9am and 5pm. In July, August and September this is extended to 7pm, and until the day that the clocks change in October, it operates until 6pm. If you take one of our guided tours, you select the time when you book. If you have tickets for the cable car but it’s not open for technical reasons, or because of the weather, on the date you’d chosen, you can exchange your ticket for any other day, the limit being a year (365 days) from the date on which you bought it. You can also change the time for the same day if it reopens, or ask for your money back free of charge. You can read all about what to do if the cable car closes here. 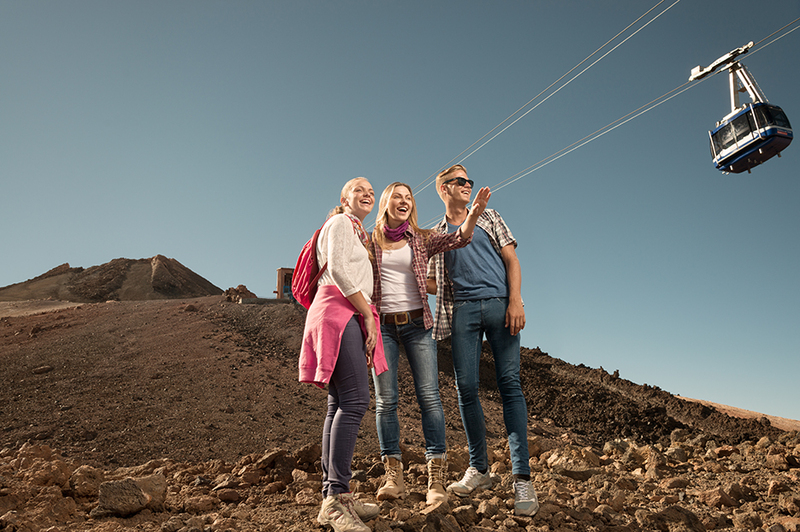 You’ll be accompanied at all times by an official Teide National Park guide who will introduce you to the wonders of the volcano in the best way possible. Did you know you can go up on foot too? It’s a big challenge, but it means you can reach the peak and see the sunrise from there, having spent the night at Spain’s highest accommodation, Altavista. Spending the night there having walked from Montaña Blanca means you can climb the Teide without a permit and take route number 10 to the crater with no applying for anything, as long as you leave before 9am. It’s definitely not easy, but you’ve got various choices. Want to find out what they are? If you want to spend some time reading everything there is to know about climbing the Teide, this post includes all the details you need. It looks at permits, the different options for getting to the top and the alternatives that we’ve explained to you here for climbing the Teide without a permit. 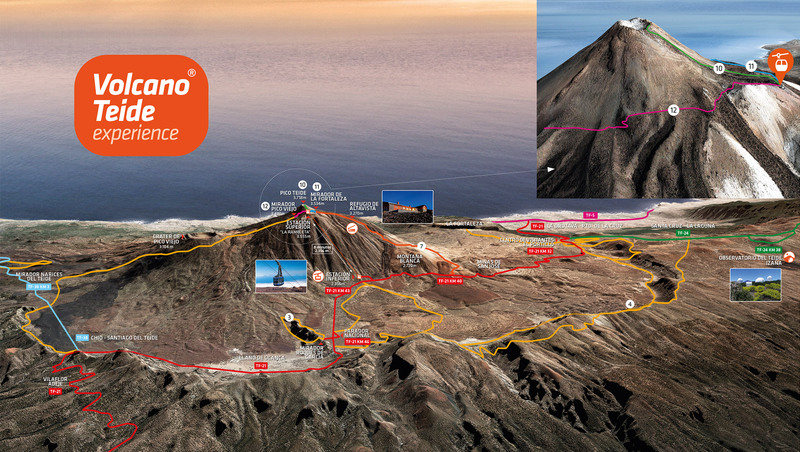 We’ll see you at the Teide!